As I sit down to write this review, I can hear the words ringing in my head, “another commentary series?” Or maybe, “another review defending the existence of another commentary series?”. The answers to these questions are yes and yes. 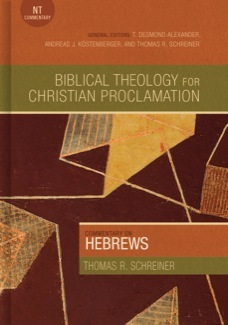 However, I admit I too have skepticism of my own when I hear of a new commentary series being launched, but in the case of the new Biblical Theology for Christian Proclamation series, and Thomas Schreiner’s flagship Hebrews commentary in particular, I can say that my hesitations were quickly dispelled. To trace unique individual theological contributions in the given book and the role it plays in the context of the Scriptures as a whole. “[T]o relate biblical theology to our own lives and to the life of the church…to equip those in Christian ministry who are called by God to preach and teach” (xii). That is to say, this series places the insights of Biblical Theology into the hands of the pastor/teacher (hence the series’ name). This is a noble and welcome goal. Turning now to Schreiner’s Hebrews commentary, this dual aim is achieved through both common and distinctive means. The common features are found in usual introductory matters (50 pages) and body comprised of verse by verse exegesis (376 pages). However, there are some unique features not regularly found in other commentaries that cause this series to stand apart. Most striking is the 74 page “Biblical and Theological Themes” that close the book. This section synthesizes the theology of Hebrews under headings such as “God in Hebrews”, “The New Covenant”, or “Warnings and Exhortations”. At points throughout the exegesis, the reader is referred to this section for a bird’s eye view of what Hebrews has to say about a given topic. Authorship: Paul, Luke, Clement, Barnabas, and Apollos are considered, but Schreiner concludes that “all the theories are guesses” (p5). Recipients: Jewish Christians in Rome. Genre: “an exhortation, in epistolary form” (p10). Outline: he builds on Guthrie to mold his own. Purpose: negatively stated, “they must not turn away from Jesus and the new covenant and revert to the Mosaic law and the old covenant”. Stated positively, “the readers are called on to persevere, to hold on, and to keep believing until the end” (p14). Religious-Cultural Background: resonates with Greco-Roman and Jewish worlds, as well as themes found in Plato, Philo, Qumran and Paul; but it stands alone. More unique sections in the Introduction are “Hebrews and the Story Line of the Bible” (10 pages) and “Biblical and Theological Structures”, which includes promise-fulfillment, already/not-yet eschatology, typology, and spacial orientation (heaven and earth). These structures are foundational to Hebrews. As to the body of exegesis, each unit of text follows the same format, and Schreiner takes advantage of it, showing its wisdom. The exegesis is very readable, with more technical points relegated to footnotes placed at the bottom. It is easy to find the comments on a desired portion of text. Perhaps surprisingly, given the series’ purpose, all Greek is untransliterated. I for one, find this very welcome but some may be turned off to it. Among Schreiner’s strengths are clarity and readability, and these are in prime form here. Schreiner is a veteran commentator. As to Schreiner’s own theological contributions, most distinctive would be his Calvinistic Baptist viewpoint, his novel take on the warning passages, and his affinity with New Covenant Theology / Progressive Covenantalism. I will address each in turn. First, Schreiner’s Calvinism shows through at a few points, perhaps most notably in his exegetical defense of definite atonement from Heb 2:9 and 2:17. Schreiner’s take on the warning passages is fresh and compelling, and given his Calvinism, surprising. He accepts that they present a loss of salvation, but that they should be read rhetorically rather than descriptively. That is, the warnings do not tell us that that believers can fall away, instead they encourage believers not to fall away! Schreiner affirms that believers cannot be lost, “the warnings are always effective in the lives of those elected and chosen by God” (p489). For more on Schreiner’s view, see my post here. Lastly, Schreiner holds presents neither a Dispensational nor Covenantal framework, but resembles that most closely the Progressive Covenantalism of fellow-SBTS faculty Stephen Wellum and Peter Gentry (authors of Kingdom Through Covenant). Dispensationalists may balk from Schreiner’s typological view of the land promise in lines such as, “Canaan points to something greater, something more profound and lasting than any location on earth” (p351). Rejection of Covenantalism can be seen in Schreiner’s view that the Old Covenant has been abolished in full, “believers are not bound to the stipulations and regulations of the old covenant” (p475). I note Schreiner’s unique views not to pigeonhole him or dissuade those from other points of view. A commentary ought not be evaluated merely on its conclusions, since we want to engage the text, not reinforce our own viewpoints. In my opinion, Schreiner’s skill as an exegete outweighs any hesitation one should have given his conclusions. Some choose a commentary because of its series. Perhaps the series is tailored for preaching, or perhaps it is devotional, or it is academic and engages with a broad range of scholarship. Perhaps it is the reputation of the series, or publisher, or editors of the series, that informs the choice. Others choose a commentary based on the author. Perhaps one enjoys his writing, or his reliable scholarship, or his unique outlook. With Schreiner’s Hebrews (BTCP), I can happily conclude that here we get the best of both worlds. Here a veteran commentator is working with a unique series for pastors and teachers. I’ve never not enjoyed a commentary by Schreiner. Even his enemies like him. This series is written by academics for preachers, so we have good informed scholarship in service of equipping the church. The BTCP series encapsulated by Schreiner’s Hebrews doesn’t talk down to the audience, but neither is it bogged down by capitulating to academic concerns. I eagerly await the next volumes and can thankfully conclude, “another commentary that a teacher should have on their shelves”. Is Mark 13 About Jesus’ Impending Death and Resurrection?